We love these Hemmed Napkins, Placemats and Table Runners! They are made from a mid weight 8oz. 100% bleached cotton canvas. The Runners, Placemats and Napkins are single layered and hemmed. 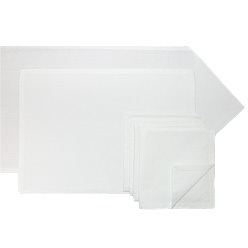 They look and feel like high-end restaurant table linens, but at these prices they are also great for kids arts and crafts projects or home decor. Even though these items are hemmed we still recommend that you handle them with care when dyeing and washing. Very heavy cotton. Seems to be very durable. Takes some effort to get an even dye job but once achieved the color is vibrant. Only complaint is that the stitching wasn't 100% cotton so it did not take the dye.